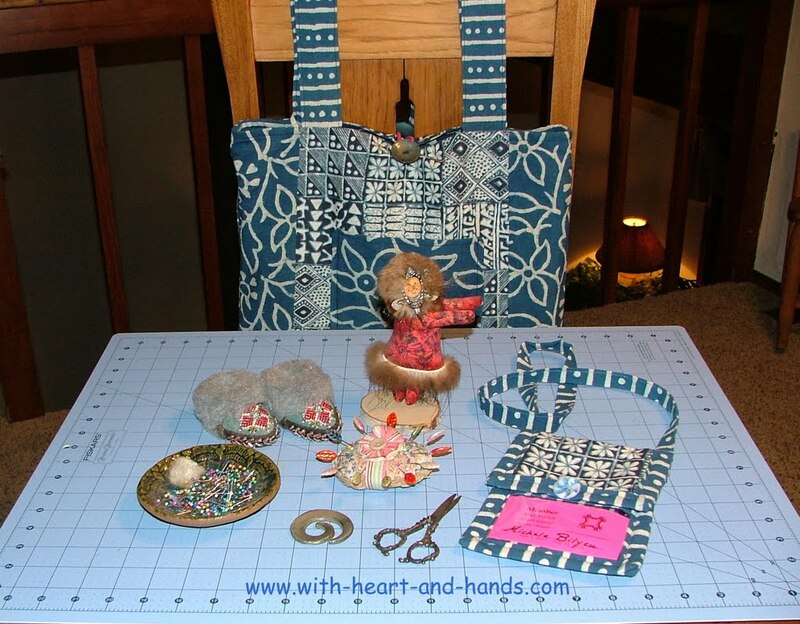 “To sew is to pray. Men don't understand this. They see the whole but they don't see the stitches. We mend. We women turn things inside out and set things right. We salvage what we can of human garments and piece the rest into blankets. Only a woman's eyes can tell. I learned to sew by watching others. I learned from two grandmother's....my French one in Louisiana and my Finnish one in Alaska. My Alaskan grandmother was constantly mending, repairing so many utilitarian garments for work, fishing, hunting, school. She was always darning socks and I was fascinated by the process and the little wooden egg underneath. 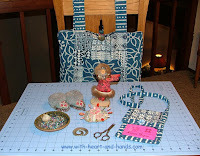 When she sewed her own house-dresses and aprons, it was on a treadle sewing machine and that is how I learned to sew. We moved into her home after she passed away and I took her 'sewing room' downstairs ..a tiny bedroom..rather than one of the bigger bedrooms. I was pulled to it as if by magnetism. Little did I know at age 8 how much sewing would become a part of every fiber of my life. I have that treadle today. It survived my childhood home burned to the ground in 1970. It is scarred by that fire but is one of my few great treasures from my youth. My French grandmother in Louisiana couldn't afford a sewing machine, so she sewed and quilted by hand for many decades. I have one of her quilts today and it is a true treasure. Luckily it was still in her little house and and not brought up to Alaska on one of our many trips and so did not go through the house fire in Alaska. We visited when we could but it was 5,000 miles away and we always drove down the Alcan Highway all of us crowded into a car and sleeping as my father drove. I learned by watching my mother. Mother of 5 children all born about a year and a half apart.She still found time to sew us beautiful clothing for special occasions. Little dresses and pinafores for me, shirts for my four younger brothers and my father. And always costumes...for the Fourth of July Parade through the streets of Douglas, Alaska. For Halloween as we walked the "Ghostwalk" at Mt. Jumbo School in October. For Christmas or Birthdays..something new. I learned from watching my father teach himself to sew because my mother told him that making a canvas rainshield roof for our boat.....one we could always have up as it was the rainforest part of southeast Alaska and stand up under as we zipped over the ocean waves. One with a zippered door and lots of see through plastic windows. My mother said it was too much on top of all of us and too much for new Singer sewing machine. So, my dad got an old rough and tough machine, bought canvas and industrial zippers and plastic and made one himself. It was beautiful and perfect.I grew up believing that my father could do anything. That belief has served and blessed me all my life. Men sew, men quilt, men design and men pray. But only if they feel the yearning for the magic of creativity with the sublime and not all can or do. Women were always able to but not all choose to. My grandmothers did. My mother and father did. My father understood the prayer in the garden, the prayer in the drawing and the painting, and the building but also the prayer in the sewing. They passed it all on to me. So I sew. So, if you can't find me, or you don't hear from me, or you wondered what happened to me....I am sewing. I collect heart rocks, too! Hugs! Your post so touches my heart. When I had a family living at home I felt that way about cooking. Using the bounty God has given us to nurture the people he gave me to care for. I SOOOOOO love your header Michele!! The wonderful colors excite me!! What a wonderful legacy. You are "sew" blessed. I agree sewing/stitching, gardening, even housework is prayer if we do it with that attention. What a wonderful post, really touched my heart and how I feel about creating. 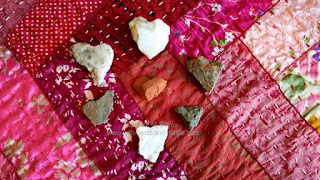 The heart rocks are what caught my attention, and your postings and inspiration, as well as tutorials are wonderful, will read more of them and hopefully I can start making things for others.